UNITED NATIONS, October 14 , updated - When the UN Security Council met for its monthly "horizon briefing" by the Department of Political Affairs on Friday, multiple sources told Inner City Press that the topics were Somalia, Madagascar and sanctions. On sanctions, as exclusively reported by Inner City Press, a draft resolution for additional sanctions on Eritrea was circulated in Friday morning's session. 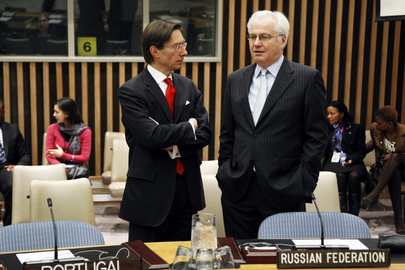 Not on agenda but discussed, according to German Ambassador Peter Wittig, was the issue of Syria. Wittig emerged from the Council and told the press that he had raised Syria, saying that since the double veto, which Syria celebrated as a victory, the crackdown had continued. Moments later, Russian Deputy Permanent Representative Pankin likewise told Inner City Press what he had said in consultations: that raising Syria was "procedurally improper." Pankin said, "Somalia and Madagascar were on the agenda. If you want to raise Syria, do it the proper way." Clearly, the rifts in the Security Council continue. So too, it appears, in the Arab group, which met Friday afternoon at Qatar's mission to the UN at 809 UN Plaza, source said on the topic of the alleged Iranian plot against Saudi Arabia's ambassador in Washington. Some speculated that the locale and topic meant that Syrian Permanent Representative Bashar Ja'afari would not attend. But he arrived, smiling, at 4:05 pm. Moments later Somalia's Permanent Representative went in, followed ten minutes later by Morocco's Permanent Representative Loulichki, seeking a seat on the Security Council in the October 21 election. We'll have more on this - watch this site.